Saturday October 12th was not only the 93rd meeting of the Midlands Meccano Guild, it was also the day on which the vacant position of President was filled, to unanimous approval, by none other than lifelong Meccano enthusiast, modeller and former dealer par excellence, Geoff Wright. 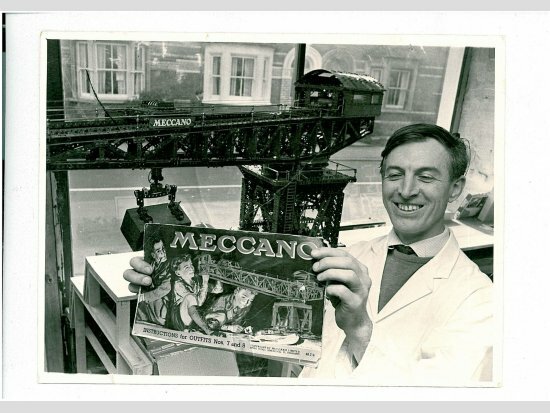 To most of those members of the Guild who admit to a certain maturity of years, Geoff needs no introduction; being an iconic figure whose career has been very much a part of the Meccano story. 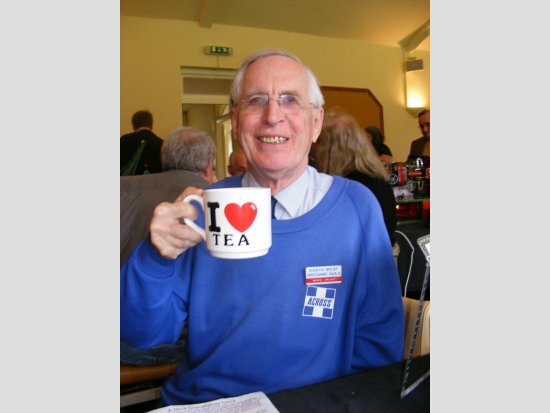 However, bearing in mind the possibility that more recent converts or returnees to the hobby may not yet be aware of the full extent of Geoff’s contribution, I eagerly accepted Roger Marriott’s kind invitation to pen a short piece to bring everyone up to date. An extensive biography of Geoff, “Everything Meccanoman” consisting of five instalments, appeared in Constructor Quarterly issues 94 (December 2011) to 98 (December 2012). Extensive it may have been, but much more could have been added, such are Geoff’s manifold contributions and achievements in so many different endeavours inside and outside of the hobby. Born in Glasgow in 1930, Geoff’s three lifelong interests of Railways, Model Railways and Meccano were engendered at the very early age of two by his mother Elsie. It was she who wheeled him in his pram to watch trains at the nearby Kirklee station. She also bought him a Bing 00 model train set, but, most significantly, introduced him to Meccano with an 00 Set, making his favourite models for him until he developed the necessary manual skills to make them for himself. Over time this and other kits were augmented by a No. 1 Aero Constructor and blue/gold No. 1 Sets, plus spare parts bought directly from Binns Road. By the end of the 1930s Geoff was the proud owner of more than an Outfit 6. Sadly, these happy days were increasingly overcast by rumours of war, and in September 1939 came the beginning of WW2. With Meccano rapidly disappearing from the shelves of toy shops, Geoff’s mother bought him one of the last Geared Roller Bearings available. As one can imagine, Geoff was overjoyed at this fine acquisition, but his stock of parts was insufficient to do it justice. He never achieved its full potential, and a fellow pupil at school bought it from him a few years later. The post war years saw the Wright family relocate from Glasgow to Northend, a village north of Henley, then again to Henley itself, as Geoff’s father set up as “Maxwell Wright Scale Models” and sought work making architectural models then needed for the construction industry. 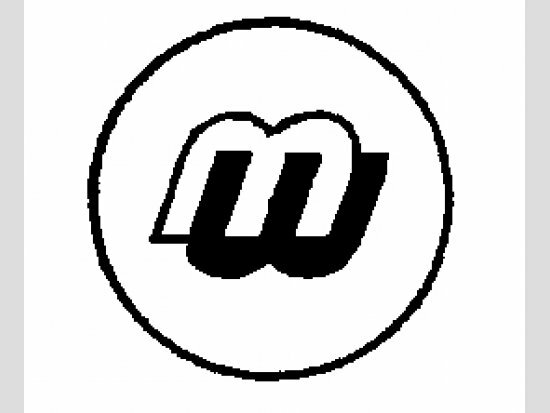 A logo using the MW initials was designed by Reg Atley, who lived nearby, and this designation became the “MW Models” title of Geoff’s own business later on. Geoff’s National Service with the RAF came in 1951, but this lasted only three weeks, with his susceptibility to hay fever in dusty conditions leading to his early discharge on medical grounds. During this short interval Geoff was put to work scrubbing hospital floors! From these beginnings Geoff continued to develop, through the 1950s and early 1960s, a comprehensive range of proprietary scale loco conversions, covering 2 to 3 rail (and vice versa) plus a host of other alterations. In all his work, Geoff stayed loyal to his father Maxwell’s own exacting standards of workmanship, ensuring a quality result and high customer satisfaction. In due course Geoff was made a director of E.A.M.E.S. which was a fitting recognition of his valued service. Geoff married Elizabeth in February 1960 after an eight month engagement, and the happy couple set up home in a new build estate just over a mile up Greys Road. Later they were blessed with three daughters; Sidonie, Heidi and Candida. Events took a significant turn in early 1964 when Ted Morris informed Geoff that his son David was coming into the workshop. Geoff assumed that he intended David, a trained engineer, to take his place. Conscious of being self-taught, he tendered his resignation and left. Recently in a chance meeting with David, Geoff recalled the events of the time, and was astonished when David told him that he had only been coming in for a fortnight and had a better job lined up elsewhere, but thanks to Geoff he had been sentenced to twenty-five years working at E.A.M.E.S.! Thus it was then that through an unlikely turn of events, Geoff found himself setting up with his younger brother David, as “M.W. Models – Model Railway Engineers”, using the original logo which inspired their trading name. With the increasing standardisation of model railways, however, business declined through the later 1960s, leaving Geoff on the lookout for the next opportunity. This was not long in coming, as Geoff happened to notice during one of his visits to his former employer, E.A.M.E.S., that there was a large quantity of Meccano on sale for reduced prices. This was the combined remaining stock of a chain of now closed ‘Sterling’ toy shops. Geoff made an offer for the lot, which was accepted in the form of three post-dated cheques! Thus it was that the famous MW Models shop began trading at 165 Reading Road. Another early customer was MMG member Bob Faulkner, who lent Geoff his magnificent Block Setting Crane for display in his shop window. He also sponsored Geoff’s membership to the MMG, but with Geoff being a dealer (!!!!! ), Bert Love was not best pleased! Ted Knowles, the affable Sales Manager of Meccano Ltd. in the 1970s, referred to Geoff as “The doyen of Meccano Dealers!”, an accolade which was roundly endorsed by all within hearing distance. The expanding business was, in 1979, transferred to Greys Road where, with its glittering model displays and top class counter and mail order service, it remained a beacon of Meccano sales excellence until its closure in 2003. Geoff was faithfully supported throughout by Elizabeth, ministering to the needs of the vast majority of calling customers and making up most mail orders. His mother Elsie was the first of a long line of mail order ladies who packed and posted orders, and she also attended to the banking until she was in her eighties. Both Elizabeth and Geoff received “Golden Spanner” awards from the International Society of Meccanomen in September 2007. This was in recognition of both of their outstanding contributions to the Meccano hobby. Geoff is aware of many defining moments which benefitted his career, that someone above was looking after him. Why? He came to realise that Meccano has been the medium to join model-builders in a fraternity throughout the world, and he feels privileged to have played a part in it. Since retirement Geoff has found himself with more time to devote to Meccano modelling, and his series of public transport vehicles is well known for his trademark attention to detail and accurate scale. I am delighted that Geoff has accepted the Presidency of the MMG, and I’m sure I speak for everyone in wishing him many happy years of tenure.